Belgians, in the realm of beer at least, are slow to give up their traditions. As late as the 1960s, they were still resisting the charms of industrial lager, and when you pore through the gem case that contains Belgian ale styles, you still find many ancient treasures. And until fairly late in the 20th century, Belgians hankered mainly for dark ales. This was true of most of the barley beers, which in the 19th century were regularly boiled for eight or 10 hours to develop color (wheat beers were different; they could be made pale or “white”). Drinkers and brewers both believed a long boil was critical in developing flavor, and deeper color was its proof. Golden hues in a barley beer would have seemed pale to them in all the wrong ways—pale flavor, pale strength, pale quality. 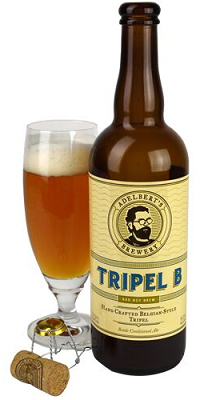 Indeed, blond ales were such a rarity that, when the monks at Westmalle released a coruscating, golden beer called Tripel in the 1930s, it counted as a radical move. The Trappist order believes monks should support their own monasteries; it’s the reason they got into brewing (and cheese-making) in the first place. But it’s the next part of his story that reveals the essence of monastic brewing. “… in 1954 it was Brother Thomas Sas who developed the ‘Tripel’ as it is today,” Adriaensens reports. “I never updated the recipe, which is something the monks explicitly asked me.” Development of the beer started years before it was released, and the monks let it evolve over the next two decades. Eventually, they liked what they had and kept it that way. Monks are used to thinking in terms of decades or centuries rather than the next quarter or year; perhaps they saw the future because they were used to peering so deeply into time. Their foresight was impressive: The beer itself is, today, perfectly au courant. Its deep golden body is offset by a snowy white head, fed by a cascade of bubbles that flash and dance to the surface. 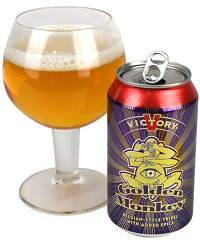 Notably, it has hops in the nose—they’re lightly herbal—along with honey and esters of pear and banana. Hop oils collect on the bubbles in the foam, and they arrive first in the mouth. This is unusual; most Belgian beers have little or no evident hopping, but Westmalle Tripel is stiffened with a fairly stout dose. “The bitterness is very important, which is around 38 to 40 [international bittering units],” says Adriaensens. He prefers to think of the beer as “hoppy” rather than bitter, and he uses a blend of six varieties of hops. Even in this, the abbey seems to have anticipated the direction beer would ultimately go. As in most Belgian ales, though, yeast character is the essence of this beer. Expressive yeastiness is so important that Belgians do things like underpitch their wort and ferment at temperatures so high they scare brewers elsewhere. These techniques boost the flavor and aroma compounds yeasts produce. But that’s not enough. The yeast can’t produce all the flavors Belgians want in a single fermentation, so they do a second one in the bottle. The warmth of the initial fermentation sparks their expressive yeasts to kick off wonderful flavors of fruit and spice. Going through a second fermentation builds them further. It is so critical that many Belgian beers, including Westmalle Tripel, are never kegged; without refermentation in the bottle, the beer just doesn’t have the right complexity. Decant Westmalle into a goblet and allow it to breathe, like a wine. As you drink it and the beer warms, pay attention to how those esters evolve. I started taking notes, and I thought I was suffering from critic-itis—becoming too florid with my adjectives. I had written down “orange, banana, rose, apricot (peach? ), hint of ripe pear.” I went back and paid close attention. Sure enough, they were all there. Which come from the first fermentation and which come from the second? Only the monks know. Some time ago, Westmalle decided to switch from square fermenters to more modern, conical ones—a change it was feared might jeopardize critical ester formation, so Adriaensens spent eight years experimenting on a pilot system to ensure the hydrostatic pressure didn’t inhibit the yeast. Eight years is a lengthy period to perfect a process, but not in the way monks think about time. And on this occasion, they were back to their practice of upholding an old tradition. Tasting Notes: In a blind tasting, Adelbert’s would seem perfectly Belgian (more, perhaps, than Westmalle). Very few hops were harmed in the making of this ale; instead, the sweet, fruity palate is balanced by a spicy phenolic clove note and tart, aromatic yeastiness. It’s remarkably moreish—dangerous in a 9.3% beer. Tasting Notes: Belgians dabble in spicing their ales with regularity, and the best conceal their identity by just enhancing and inflecting flavors produced by the yeast. Victory achieves this, too, by using spices (ginger? coriander?) that conspire with the yeast esters to produce a delicious mango note. Tasting Notes: This multi-award-winning beer has been rightly lauded as a classic. A peach nose evolves into something more like apricot and candied ginger on the palate. The yeast delivers Allagash’s signature—a dry, almost sharp finish that gives Tripel a refined grace. Jeff Alworth is the author of The Beer Bible.